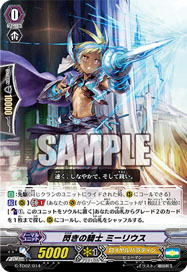 [C] [(V)/(R)]: If you have a non-::Granblue:: Vanguard or Rearguard, this gets -2000 Power. [S] [Drop Zone]: [Choose a "Deadly Spirit" and a "Deadly Nightmare" each in your (R) and Retire them] If you have a Grade 2 or higher ::Granblue:: vanguard, Ride this. Exceed! The ultimate sword lies beyond life and death!